Located in the Applegate Ranger District along the Collings Mountain Trail a half mile west of Applegate Lake, the Bigfoot trap is believed to be the only one of its kind in the nation, perhaps on the planet. And it was fortified and funded by the Federal Government-- well actually volunteers of the USDA Forest Service "Passport in Time" program. Although most projects in the program involve historic or archaeological sites, the Bigfoot trap, which draws hundreds of curious humans each year, was unusual enough to be included, observes Jeff LaLande, archaeologist for the Rogue River-Siskiyou National Forest. Measuring 10-feet-by-10-feet, it's a wooden box built of 12-inch wide and 2-inch thick planks. A heavy expanded metal grate served as the trap door, triggered by the big fellow reaching a hairy hand for the bait — a deer or rabbit carcass — hanging at the rear of the structure. Heavy metal bands binding the planks and telephone poles anchoring it to the ground were meant to keep the burly beast from breaking out. Citing safety concerns, the Forest Service bolted the trap door open in 1980. Uncle Sam didn’t want tourists trapped, bigfooted or not. 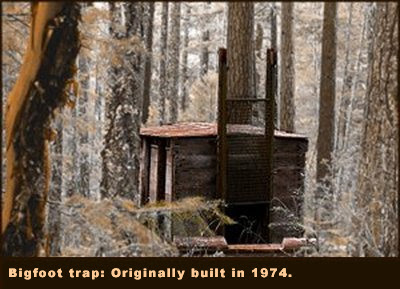 The trap was originally constructed, according to forest service records, when a short-lived group dubbed the North American Wildlife Research (NAWR) firm applied for a special use permit in the early 1970s. Olson ought to know about the massive trap: He, along with his late father and a friend, built it in 1974. If you are close to the Oregon/California border near Jacksonville, take Highway 238 onto Upper Applegate Road towards the Applegate Dam. A pull-off along the right side of the side the road is used for parking. There you will find the trailhead of Collings Mountain Trail, hike just over a half mile to an abandoned miner's claim and follow a dirt trail to the 1974 structure.